the player using IOMIC finished the final round of 67 and closed a four-day total of 18-under 270 to earn her first victory this season and her third victory on the US LPGA Tour. Congratulations! the player using IOMIC finished the final round of 64 and closed a four-day total of 15-under 273 to earn her first victory this season and her sixth victory on the US LPGA Tour. the player using IOMIC finished the final round of 72 and closed a four-day total of 8-under 281 to earn the first LPGA Tour win of her career. the player using IOMIC finished the final round of 70 and closed a four-day total of 14-under 270 to win LPGA Tour season opener. At Waialae Country Club, Hawaii, on 10-13 January, the player using IOMIC finished the final round of 66 and closed a four-day total of 22-under to earn victory. and closed a four-day total of 20-under 268 to earn his first victory this season. the player using IOMIC got 5th place in the CME Group Tour Championship. 2018 LPGA Player of the year and the Vare Trophy. Congratulations! and a four-day total of 22-under 262 to earn his first win since 2014.
and closed a four-day total of 8-under 280 to earn her first LPGA tour win. and closed a four-day total of 17-under 271 to win his first Asian Tour title. the player using IOMIC finished the final round of 69 and closed a four-day total of 13-under 275 to win her second career title. beat the United States team 17.5-10.5 to win the 42th Ryder Cup. and closed a three-day total of 15-under 201 to earn her first victory this season. and closed a four-day total of 13-under 271 to earn her third victory this season. and closed a three-day total of 17-under 199 to earn her victory. closed a three-day total of 8-under 208 to earn her first victory. and a four-day total of 16-under 276 to become the first winner of this championship. and earned her first US LPGA Tour victory. Congratulations! and closed a three-day total of 13-under 203 to earn her first victory in 6 years. and a three-day total of 21-under 192 to earn her first US LPGA Tour victory. She became the youngest Japanese female player to win on the US LPGA tour. and earned her first victory this season. Congratulations! and closed a three-day total of 14-under 202 to earn his first victory. and a four-day total of 22-under 262 to earn victory. to go with the 2016 Women’s British Open. Congratulations! a three-day total of 11-under 205 to earn his second victory this season. and had a victory over the opponent. This is her first Japan LPGA Tour title. three players finished the rain-shortened, three-day tournament with 14-under 199.
and closed a three-day total of 3-under 213 to earn her first victory. and closed a three-day total of 8-under 208 with a wire-to-wire victory. and had a victory over the opponent. Congratulations! and a three-day total of 13-under 203 to earn victory. and a four-day total of 12-under 272 to earn her first LPGA Tour win. She and her sister became the second set of siblings to win on the tour. and a four-day total of 14-under 270 to earn victory. This is his first Japan tour title and second Asian tour title since 2004.
and had a victory over the opponent. This is his first Japan Senior Tour title. a four-day total of 12-under 272 to earn his first Japan golf Tour Victory. and a four-day total of 15-under 273 to earn his first major title. Congratulations! and a three-day total of 10-under-par 206 to earn her second victory this season. Congratulations! and a four-day total of 18-under 270 to earn his first PGA Tour win. Congratulations! and closed a four-day total of 19-under 269 to earn her first victory this season. Congratulations! first day was out because of the bad weather. to earn her first victory this season. Congratulations! the player using IOMIC finished the final round of 73 and a four-day total of 10-under-par 278 to earn her second Ladies European Tour title. Congratulations! and closed a four-day total of 14-under 274 with a wire-to-wire victory. This was her debut tournament as an US LPGA member! Congratulations! At Pebble Beach Golf Links, California, on 8-11 February, the player using IOMIC finished the fourth round with a 3-under 69 and a four-day total of 17-under-par 270 to earn his second victory since 2012. Congratulations! over the opponent in the match play final. Congratulations! At Abu Dhabi Golf Club, UAE, on 18-21 January, the player using IOMIC finished the fourth round with a seven-under 65 and a four-day total of 22-under-par 266 to earn first victory this season and retain his Abu Dhabi Championship title. Congratulations! The Queens Presented by Kowa contested by teams representing the tours of Japan, Korea, Australia and Europe was held at Miyoshi Country Club, Aichi, Japan, on 1-3 December. 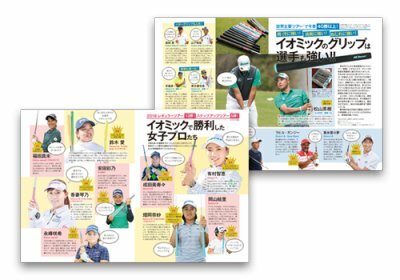 Japan LPGA Tour team including the players using IOMIC won the matches with 3 wins and 1 draw against the Korean LPGA Tour team and had second time victory in 3 years. At Jumeirah Golf Estates, Dubai, UAE, on 16-19 November, the player using IOMIC finished 21st in the DP World Tour Championship, Dubai. As a result, he won the Race To Dubai and became Europe’s No. 1 player for 2017. Congratulations! At Tiburon Golf Club, Florida, on 16-19 November, the player using IOMIC finished the fourth round with a five-under 67 and a four-day total of 15-under-par 273 to earn her second victory this season. Congratulations! shot a bogey-free, 7-under 65 in her final round and finished at 17-under 271 with her first LPGA tournament victory in eight years. Congratulations! shot a bogey-free, 8-under 64 in his final round and finished at 16-under 200 to earn his second victory this season. At Liberty National Golf Club, New Jersey, on 28 September-1 October, American team including the players using IOMIC beat the International team 19-11 to win a seventh successive Presidents Cup. カリー・ウェブ カリー・ウェブ 今季2 今季2 勝目 !! 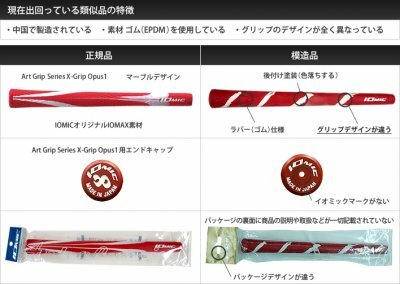 2012年新商品　Art Grip Series "Sticky Opus3"が5月7日、いよいよ発売となります! !